Fitness professionals worldwide recognize the Roman Chair & Back Hyperextension for its unsurpassed development of the abdominal, oblique, lower back, glute, and hamstrings. Thick, double-stitched DuraFirm"! pads and oversize 8" foam rollers provide comfort and support. The quick-change safety pull pin allows multiple angle back pad adjustment from flat to an exact 90 degree angle. Featuring full-length steel reinforced back and seat pads that provide double incline adjustments, it's perfect for a variety of barbell and dumbbell exercises. Increase your strength and flexibility with this ultra-tough workout bench. DuraFirm™ extra-thick upholstery adds comfort and stability to your exercise routine. The pad is positioned on the Body-Solid 2" x 3" commercial mainframe with four-side welded construction. The Body-Solid GDFID225 Multi-Bench is the perfect training partner - functional, compact, portable and durable. It requires no assembly and is designed to be used straight out of the box. Features include seven adjustment positions for flexibility and comfort. The 2” x 3” oval tubing ensures durability and support for the heaviest of workouts. The new FID46 is based on a heavy gauge 3inch round stock steel mainframe, with a 9-position seat and back pads that are a full 2¾inch thick and will never bottom out. 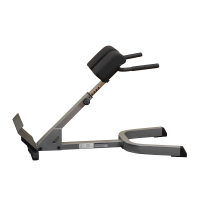 Perfect for all types of barbell and dumbbell exercises, the FID46 works great in Power Racks, Smith Machines and the strongest leverage gym system in existence.